Richard Schmittel keeping an eye on his screen system. 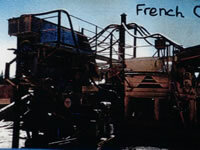 Another view of the scrubber. Shows splitter portion of the recovery system. 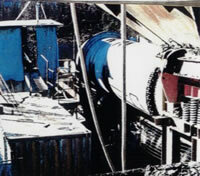 Recovery system consisted of a splitter that fed four sluice boxes on each side (eight total). Each sluice then went to each one of eight yuba jigs. From the eight yuba jigs the material went to a secondary jig and finally to a tertiary jig. A better picture of the splitter, jigs, and sluice boxes. Poor quality picture showing last jig. Also shows clean up container of the find gold and black sands. 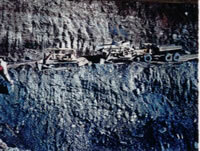 View of the ore body and equipment working.